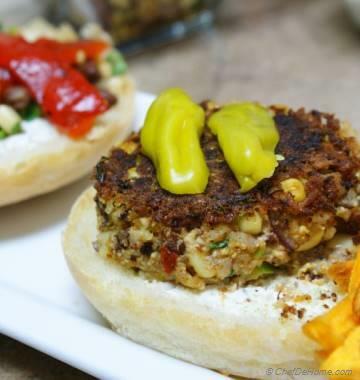 vegan, gluten free, and packed with ton of zesty flavors! Doesn't it look delicious, loaded, and bursting with flavor?? Remember, I told you about my barometer of measuring "how we eating anytime of the year"?! It starts showing a red-alert if I skip sharing/eating a salad, for few days. :) To make sure we include more and more fresh raw produce into our diet, at least twice a week, if not more, I make sure to serve salad for dinner or lunch. You know, Vishal and I, are addicted to salad for lunch. I also adore salads, because these help me, get both of us, daily recommended supply of fresh vegetables and fruits. This beautiful, colorful salad is not just healthy, it tastes delicious and also is very easy to prepare. Once you have blended the creamy Avocado Dressing, rest everything is just assembling the ingredients. 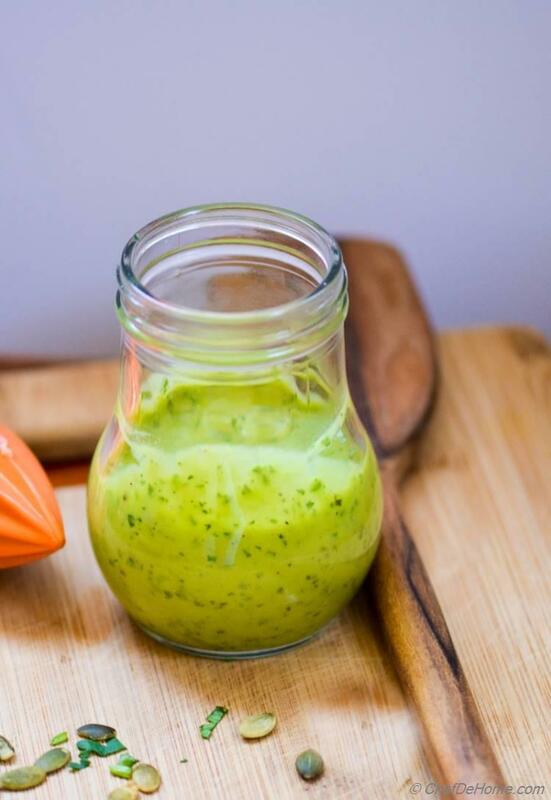 Creamy, tangy, zesty Avocado-Lime dressing is packed with ton of flavor and has ONLY good fats to offer from our humble avocado, of course! 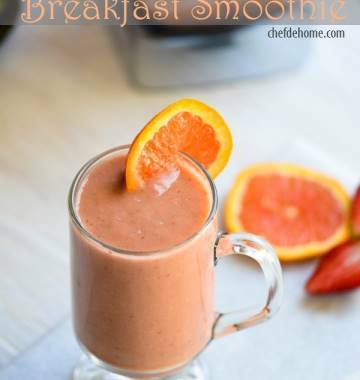 I suggest, blend a big JAR as it tastes scrumptious! 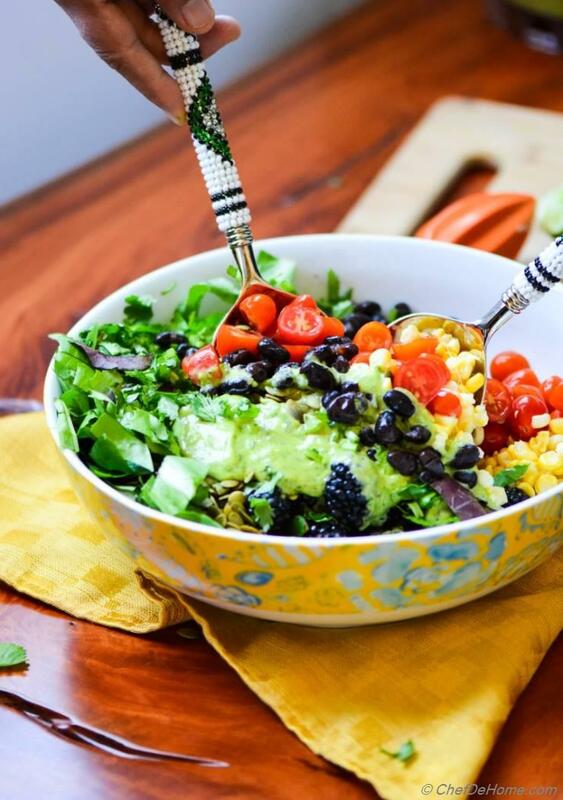 For this salad, I have used chopped crisp romaine lettuce, hearty black beans, juicy corn, whole plum blackberries, sweet grape tomatoes, some pepitta seeds for crunch and lots and lots of creamy avocado dressing. I must say, this salad is very versatile. You can use any ingredient of your choice. 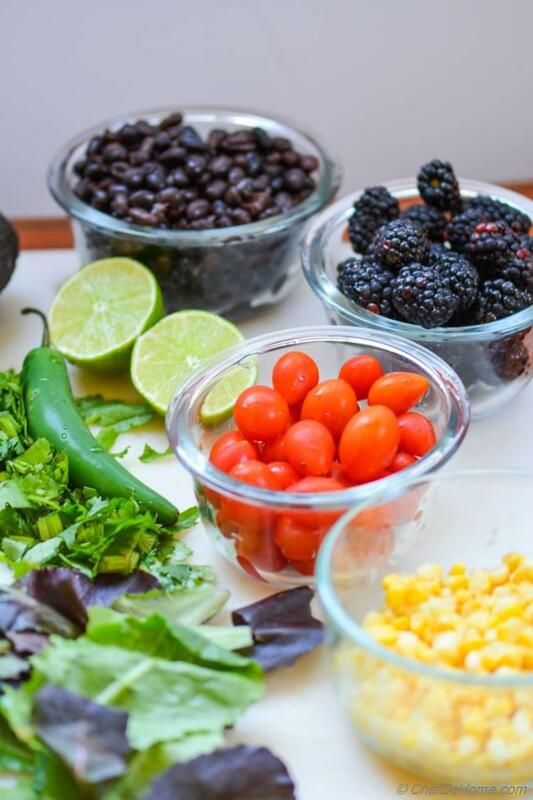 I mean, replace black beans with chickpeas, use any berries, like raspberries, or strawberries instead of blackberries, even you can use any salad green of your choice! I'm so fond of salads for lunch, that want to declare #saladforlunch moment!! No kidding! 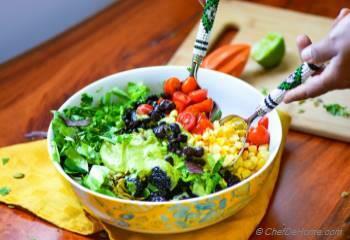 Include more salads in your diet for a healthy YOU, today and tomorrow!! Let's fix health one-day-at-a-time and with one-healthy-salad-at-a-time!! And I have a long list of salads, for you to start today, and keep going for months! 1. This salad is vegan and also gluten free! 2. Even though vegan, you will not feel deprived of creaminess with zesty and creamy avocado dressing. 3. This salad is also nut-free, and soy-free. 4. 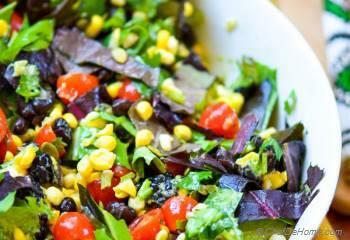 You can bring this salad to dinner or lunch table in just 15 minutes!! How cool is that?? 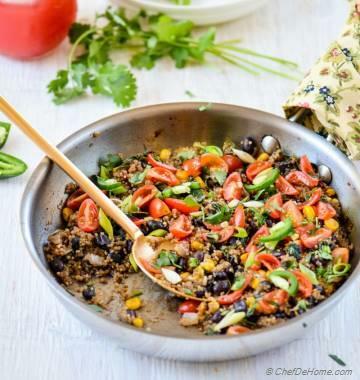 This Mexican Black Bean Salad is truly a feast for all five senses. It’s an crunchy, flavorful, and colorful dinner/lunch option: perfect for spring and even summer season. These days, this salad is on top of my menu-list! 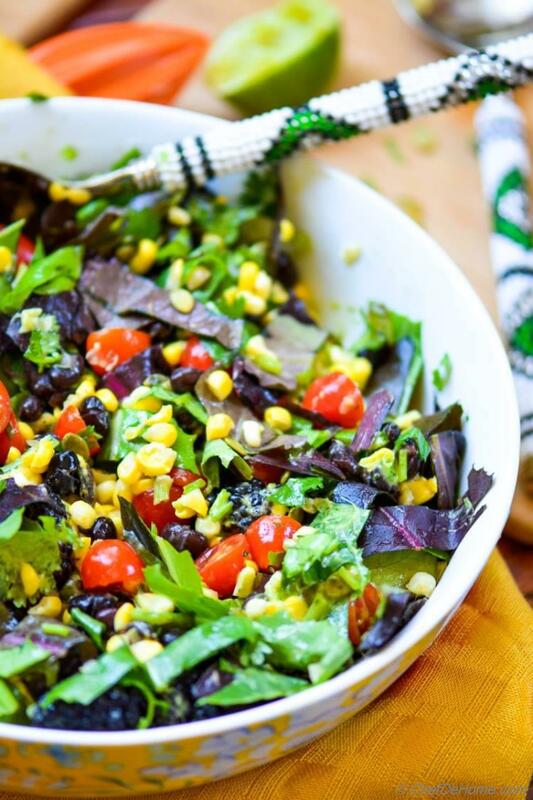 I just finished a batch of this salad for lunch as I'm sharing this post with you! 1. 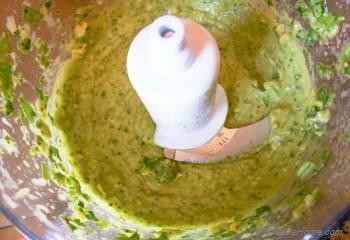 To make dressing, in a food processor jar, process jalapeno, avocado, lime juice, cilantro, black pepper, olive oil, and 1/4 teaspoon salt. Make a smooth dressing, then taste and adjust salt and black pepper. Set aside. 2. 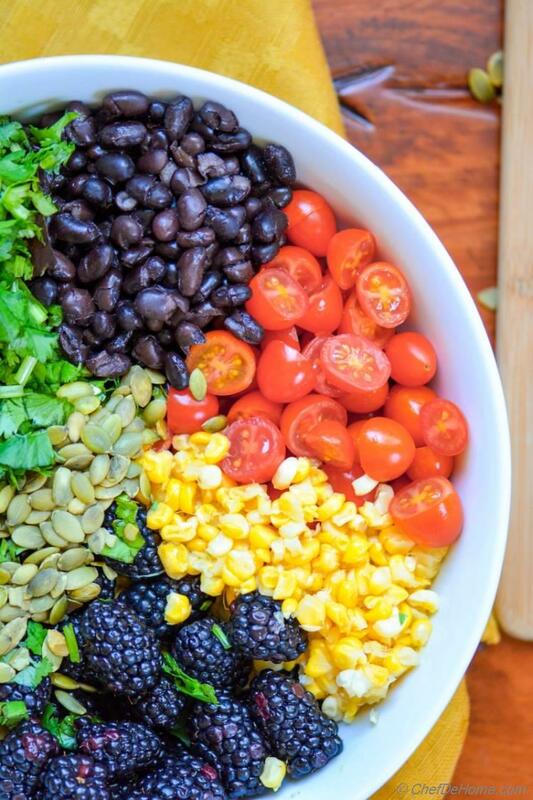 To assemble salad, in a large salad serving bowl, add chopped romaine, cherry tomato, corn, black beans, black berries, half of pumpkin seeds, and chopped cilantro. Pour dressing over and gently toss to combine. You can use fresh corn steamed or fire roasted, or frozen corn soaked in boiling water for 5 minutes. 3. Garnish with remaining pumpkin seeds. Serve chilled or at room temperature. Salads are my weakness! This one looks gorgeous! Pinned! Mira, we are on same page for our love of salads! really, me too adore them all four seasons! thanks for the pin, buddy! you rock! I LOVE your Mexican recipes! This salad looks amazing! Olivia, thanks for encouraging words. I appreciate that! 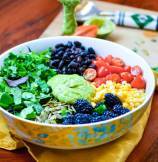 What an awesome looking delish salad bowl. Looks so vibrant and refreshing. Loved that avocado lime dressing! Anu, thanks my friend :) I'm glad you like this salad! Oh yeah, this dressing is real stellar, a must try! :) I wish I can pass you salad bowl too along with fork! Thanks for stopping by! Have a great day. Sathya, thank you so much my friend! Glad you like it dear. Nusrath, thanks! These spoons were my first salad-toss set, gifted by a friend :) I love using it for some color in the salad pictures! I'm glad you like it. Lately I have got this sudden interest of trying all new Salads in me, fortunately its summers and I can try them rather quickly. This Salad of yours looks really refreshing Savita. Would you believe I have tried the cilantro lime dressing everyone swears by yet? have to give it a go soon..
Nupur, I'm sure you gonna enjoy salads! Summer is all about enjoying great salads! Though, I can never have enough of them, all four seasons :) Nothing can beat taste of cilantro, lime and some olive oil blended together. Always a hit in my home! There is always a twist which makes your recipe so innovative and Yummy!! Loved it!! Can I please have bowl..
Kushi, whole bowl is yours, my friend! :) and thank you so much for beautiful words! What a gorgeous salad, Savita! I'm loving the black bean and berry combo. Sounds perfect with that dressing! Gayle, thanks! :) trust me, avocado dressing makes this salad even more scrumptious! I think this is a delicious salad with a silky and gorgeous dressing. You as always dear inspire me with your choice of props &amp; I'm quite fascinated by the spoon. That bowl of goodness is a winner all the way.Imagining how appetizing the flavours are yummmmm, is making that bowl oh so irresistible. Piyali, my friend, it is always great hearing from you! Thank you so much for beautiful words! I'm glad you like the flavors here :) thanks for stopping by!